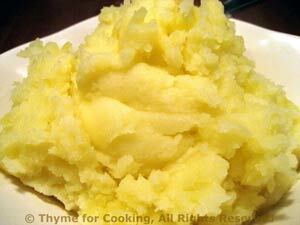 Mashed Potatoes, Thyme for Cooking traditional side dish. No garlic, onion or leek.... Simply mashed, with lots of butter, the old-fashioned way. Peel potatoes and cut into large chunks. Put potatoes in medium saucepan and add just enough water to cover. Add salt and cover. Bring to a boil over medium heat. When boiling (and pay attention or they will boil over) reduce heat and take cover partially off. Continue cooking until done, 15 - 20 minutes. They should be very done, easily coming apart when poked with a fork. When done, drain and put back on the heat 10 seconds or so to evaporate any excess moisture. Mash potatoes with a potato masher (or fork if you don't have one). Add butter and enough of the milk to get your desired consistency.